The past few weekends I have been smoking a bunch of pork butts because we had no vacuum sealed packs of pulled pork in our freezer and pork prices have been coming back down. 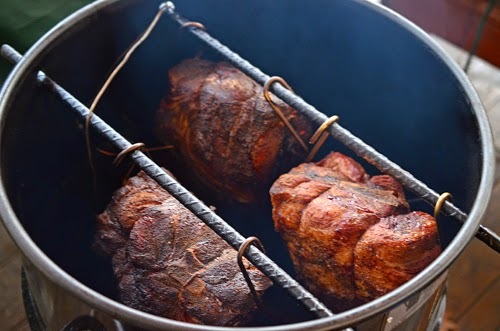 Three 8+ pound pork butts that I cooked while working on an upcoming review. Obviously the first thing you think of when you have a bunch of smoked pork is the classic pulled or chopped pork BBQ sandwich. In my case that sandwich would get a splash of a great Carolina vinegar sauce like this recipe from Lionel Bateman. I got to meet Lionel several years ago at a Kingsford event in Vegas and now he lives near us. I like this sauce because it reminds me a lot of the Lisbon, NC sauce that I use, a hybrid of Eastern and Western NC style sauces. It has the vinegar and hot pepper kick with a touch of sweetness and tomato base. 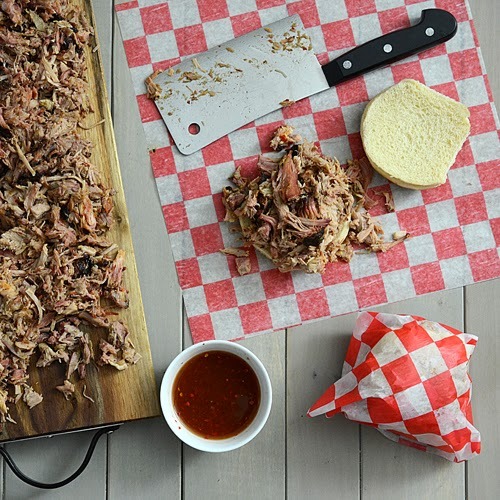 Of course, you can't always eat pulled pork sandwiches so we barbecue hounds come up with a ton of fantastic ways to use leftover pulled or chopped pork in different recipes. Here is a Cajun soup that I made up recently on a cold rainy night. 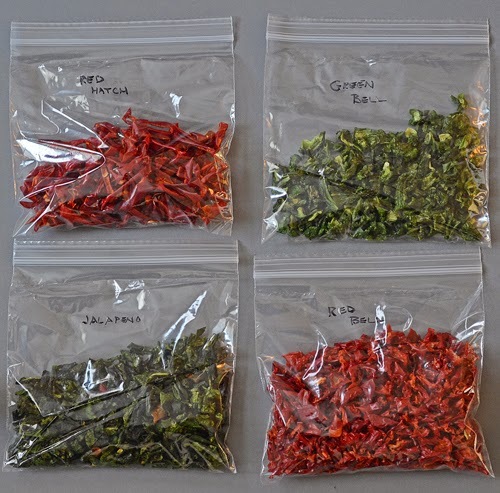 I saw this as a great chance to use some of the varieties of chiles that I had dehydrated last weekend. Cut into 3/8" cut and then dried at 135°F in the dehydrator for about 14 hours. Instead of using dried chiles, you can just use 1/2 each of a fresh red and green bell pepper, diced, and add it with the onions at the beginning. Preheat a stock pan over medium high heat. Add 2 tablespoons of the divided butter, the onions (and peppers if using fresh), pinch of kosher salt, and saute until slightly softened, about 5 minutes. Make a blonde roux by reducing heat to medium and sprinkling in the flour while constantly stirring. Slowly add the chicken stock while whisking briskly. At first it will start to seize up. Don't worry, keep adding the stock and whisking until it blends together. Add the dirty rice mix, dried bell peppers, and dried garlic. Bring to a simmer, cover with a lid, and maintain the simmer for 25 minutes. Stir in the pork, hot sauce, black pepper, and celery salt. Allow to lightly simmer for 10 more minutes. Taste for seasoning and add salt/pepper as desired. 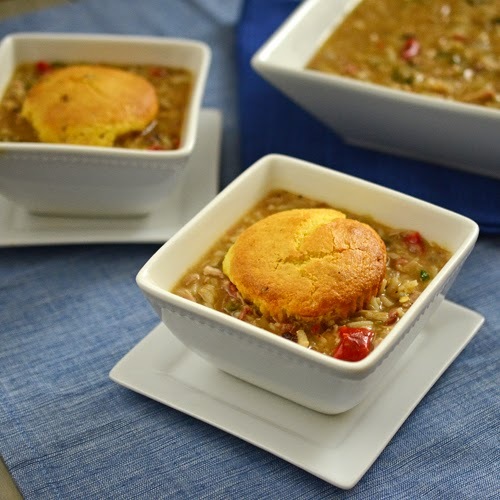 Serve with cornbread or hush puppies. We used Zatarain's Dirty Rice mix. Cheating - I needed 5 cups of stock but they come 4 cups per package so I just use 4 cups stock and 1 cup water the second time I made this. Could not tell a difference, so feel free to do that instead of opening a new carton of stock for just 1 cup. 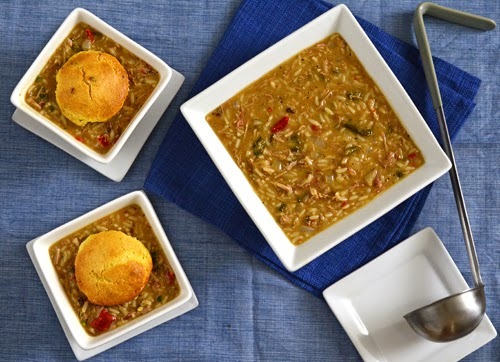 This is a very hearty soup, it won't leave you hungry. 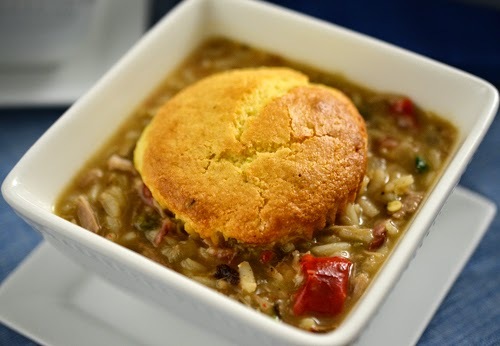 The cornbread muffin in the soup makes this perfect. Have you ever eaten at a Brazilian Churrascaria syle restaurant where everything is cooked on huge skewers and the servers carry them around to carve the selection of meats right onto your plate? We have one in Knoxville and they are a pretty fun experience, although you need to come hungry. 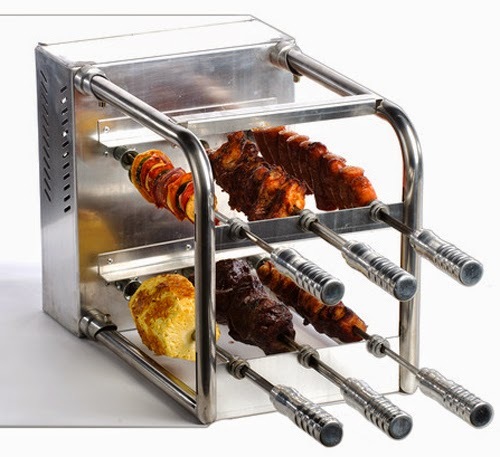 Right now there is a pretty cool Kickstarter project going on that would allow you to convert your grill to be like one of those restaurants - The Carson Rockin' Rodizio. If you saw the Memphis episode of American Grillmasters this year you saw this device in action. A friend of mine, Clint Cantwell, has one of the prototypes in his possession and he has had nothing but good things to say about it. They have tested it on many types of grills. 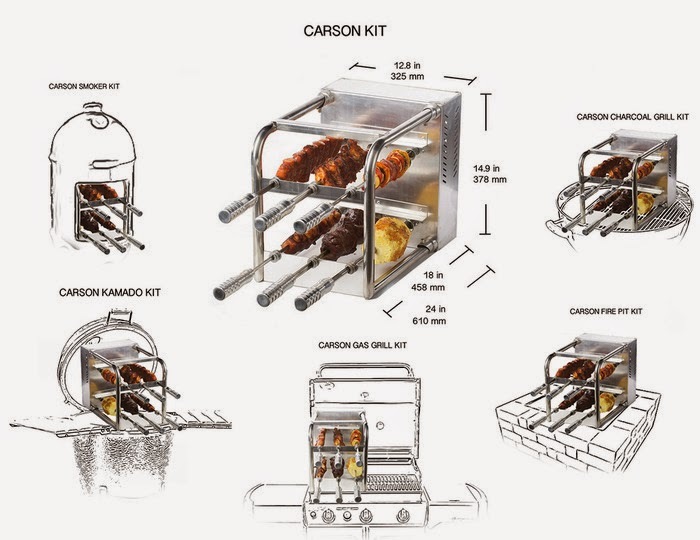 It is one of the more interesting grilling related Kickstarter projects that I have seen. Click over to their Kickstarter page to find out more if you are interested in getting in on the ground floor. [Standard FTC Disclaimer] I have no affiliation with Carson or Zatarain's and no compensation was received for this post.